The trailer for the upcoming action-adventure film Okja, about a young girl who risks everything to prevent a powerful, multi-national genetic engineering company from kidnapping her best friend, a hippopotamus-sized pig named Okja, has been released. 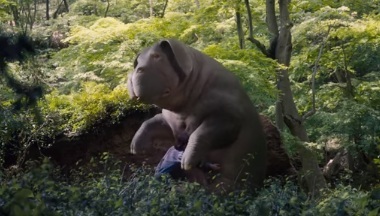 The clip features the girl, named Mija, and Okja together in a jungle, while Tilda Swinton (who plays a pair of competitive twins, Lucy, the good sister, and Miranda, the malicious one) can be heard saying: “We needed a miracle and then we got one. This beautiful and special little creature will be our revolution in the livestock industry. Our super pigs will not only be big and beautiful, they will also leave a minimal footprint on the environment, consume less feed and produce less excretions. And, most importantly, they need to taste fuc_ing good”. the leader of a guerilla animal-rights group, Byun Heebong, Steven Yeun, Yoon Je Moon, Daniel Henshall, Lily Collins, Shirley Henderson, Devon Bostick, Giancarlo Esposito and others. The song playing in the trailer is Dedicated To The One I Love by The Mamas & The Papas.